(Re-Published from the Jamestown, NY Post-Journal, June 23, 2014) INSCT Faculty Member David M. Crane has traveled throughout the world seeking justice. 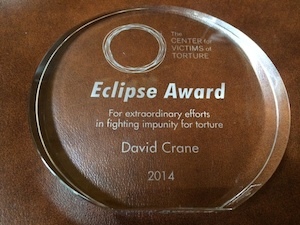 On June 26, 2014, Crane’s ongoing mission of punishing those who have committed crimes against humanity will lead him to Washington, D.C.
That is when Crane, who is the Robert H. Jackson Center board chairman, will be honored with the Center for Victims of Torture (CVT) 2014 Eclipse Award. Each year the Center for Victims of Torture presents the Eclipse Award to an individual or organization for their extraordinary service for the protection and healing of torture survivors, and for the prevention of torture. Crane, who is also the professor of practice for Syracuse University College of Law, is being recognized for his work as the chief prosecutor for the Special Court for Sierra Leone, his role in starting Impunity Watch and the SU College of Law Syrian Accountability Project, among other notable accomplishments. From 2002-2005 he was the founding chief prosecutor of the Special Court for Sierra Leone, an international war crimes tribunal, appointed to that position by Secretary General of the United Nations Kofi Annan. With the rank of undersecretary general, Crane’s mandate was to prosecute those who bear the greatest responsibility for war crimes, crimes against humanity and other serious violations of international human rights committed during the civil war in Sierra Leone during the 1990s. “It was the first time in the history of Africa, and second time in history, that a seated president was indicted, which was of course Charles Taylor [the former president of Liberia],” he said. In conjunction with SU College of Law students, Crane started Impunity Watch, an online publication which seeks to inform the world of human rights violations in real-time. Impunity Watch Law Journal is an interactive website that operates as both a law review and news reporting site. The goal of the website is to alert the world to impunity issues as they arise and to provide open access to thoughtful, cutting-edge academic debate about impunity issues. Crane said the website—http://www.impunitywatch.com—is the most widely read law review in the country, with 50,000 readers a year. He said it is a place people can go to relay acts of impunity by dictators, thugs and heads of state. He said when he first returned from Sierra Leone to the United States, he didn’t realize the lack of information people had about some of the crimes against humanity happening throughout the world. Another SU College of Law project is the Syria Accountability Project. The project started in 2011 in Crane’s international legal practice and now involves 50 law students. The project works collectively with several international organizations to provide impartial analysis of open source materials so that President Bashar al-Assad and his subordinates—as well as members of the Syrian opposition—can be prosecuted openly and fairly under the Geneva Conventions, the Rome Statute, and/or Syrian Penal Law. “Now it is an international collaborative effort so we can build a package and prosecute some day,” he said.